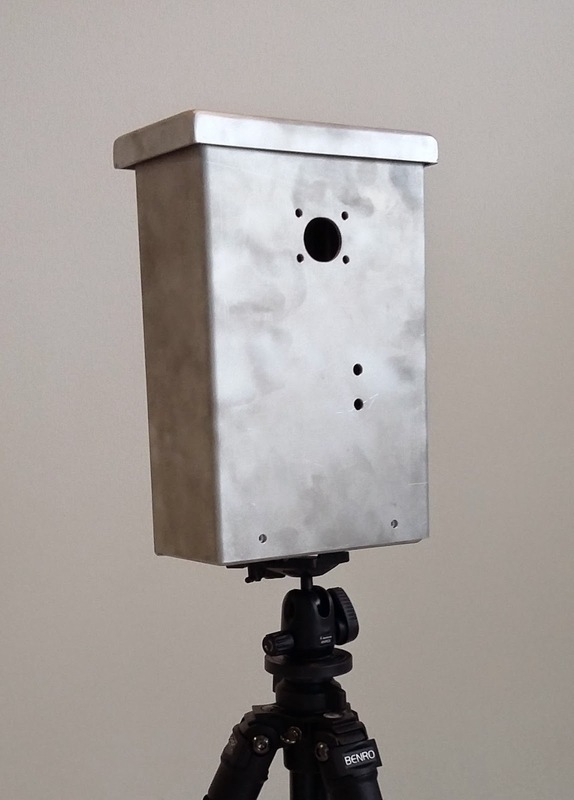 Wake-up mode camera (WUC) system, developed by the VTT Technical Research Centre of Finland, is an innovative form of detecting persons and vehicles. The idea of the camera system is to detect unauthorized objects from camera scenery and send information to background control system. Traditional detection systems are usually based on one master camera which detects, processes information and gives alarm if unauthorized object are detected. These systems can be power consuming due to heavy image processing algorithms and must therefore be installed near stationary power sources. When monitoring large and wide areas i.e. oil and gas pipe lines, power plants, border lines etc. these systems needs its own infrastructure with cabling and can therefore be too expensive in large scale. However the benefit of these systems is that with one unit it is possible to perform the whole decision chain from detection, object recognition to alarm. VTT implementation concentrates in introducing small, low cost and low power consumption wake-up camera units to detect unauthorized objects, especially beyond the perimeter of some Critical Infrastructure (CI). The target of the implementation is to provide detection system to wide area facilities i.e. gas, oil pipe lines and large factories where monitoring is needed on wide area and stationary power source is not available. Wake-up camera system consists of one to several wake-up camera units that are working stationary and independently around monitored area. WUC units are connected wirelessly to background system with Rule Based Engine (RUBE) that makes decision based on observations from WUC unit. RUBE estimates detection results from WUC and transforms them to security action. Security action can be alarm or backup detection with more powerful camera system. WUC unit consists of low power hardware for imaging, data analysis and communication. Used components are mass-produced off-the-shelf products which are lowering total cost. Unlike commercial image processing solutions, this implementation only uses just the mandatory components for this application to achieve small form factor. ARM Cortex-M4F microcontroller is running RTOS and image processing algorithm. As the developer has a full control over all the hardware and RTOS, available power saving modes can be efficiently used. Image sensor has also a simple DSP, offloading image compression computation. In a low power environment, communication with background systems is limited with data bandwidth and update frequency. Therefore a new approach for camera communication was implemented for WUC units. thm development done in any Windows- or Linux-based machine and then transferred into our embedded system. Leptonica library provides basic image processing functions. Starting point of the algorithm is to acquire low-resolution 240x320 pixel RGB image from the camera. Acquired image is filtered from the noise and delivered intelligent background subtraction module. Module estimates background movement in long time period to detect large scale movement from the background. As a result, algorithm provides object list containing regions of interest (ROI) with object dimension and size. Based on these dimensions, object is classified to human object and non-human object i.e. vehicles or large animals. Classification module estimates also the possible threat and reliability of detection. If predetermined conditions for triggering a Threat Event are filled, WUC system triggers and sends this Threat Event to RUBE unit which decides if an alarm to the operator has to be taken. The preliminary outdoor tests with WUC unit were performed by VTT to estimate reliability of the unit and object detection algorithm. Tests were done in two kinds of environment, on an open field and forest. In open field tests, the target was to test how reliable this system is to detect an object from different ranges. In forest environment target was to determine the system reliability to detect only partially visible human objects and vehicles. As a test results VTT has calculated the number and rate of the detections for identified objects. These measurements included also detection reliability for different ranges. Test results have shown that with low power and low cost WUC system it is possible to detect and classify objects for background systems.